Hamilton playwright Lin-Manuel Miranda gives a press conference at the Art Museum of Puerto Rico, as his father Luis Miranda looks on, in San Juan, Puerto Rico, Sunday, July 22, 2018. Miranda announced he has helped create a multimillion-dollar fund to boost the arts in the U.S. territory as it struggles to recover from Hurricane Maria. 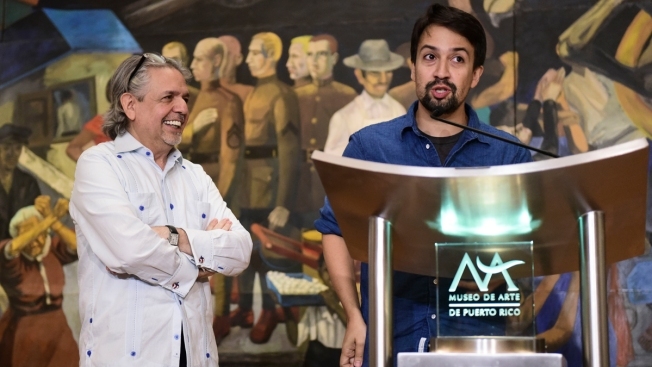 Lin-Manuel Miranda jumped up to a podium shortly after landing in Puerto Rico on Sunday to announce he has helped create a multimillion-dollar fund to boost the arts in the U.S. territory as it struggles to recover from Hurricane Maria. The "Hamilton" playwright said he hopes the fund will grow to $15 million in upcoming years. He added that he will donate all funds from the Broadway hit when it is performed January in Puerto Rico. "The goal wasn't just artistic satisfaction, but how can we leave Puerto Rico a little better than we found it," said Miranda, whose parents are from the island. Hurricane Maria caused damage estimated at more than $100 billion when it hit in September. Cultural and artistic groups across Puerto Rico have been greatly affected, losing government and nonprofit support amid an 11-year-old recession. The first five recipients of the fund include a dance school and a theater company. "This will allow us to start dreaming again, to come up with new ideas, to visit more cities. This will allow us to breathe," Julio Morales, artistic co-director of the local theater company, Y No Habia Luz, told The Associated Press. The seven-member company will receive $180,000. It had struggled to find funds and was forced to cancel all events for several months after the hurricane. The nonprofit Flamboyan Foundation will manage the fund, which will award $1 million each to the Theater of the University of Puerto Rico and the Puerto Rico Museum of Art. An award of $900,000 will go to an art education program and a dance school. Among those visiting Puerto Rico for the announcement was Hamilton producer Jeffrey Seller. "Arts will be at the center of the rebuilding effort," he said, noting that he is excited about the show's upcoming run in Puerto Rico. "The point it to lift everybody up for those three weeks." Hundreds of people in Puerto Rico recently auditioned for the historical musical about the life of Alexander Hamilton, and Miranda said he would like to bring the newest cast members on tour in the U.S. mainland. Miranda said he has to prepare for Hamilton in Puerto Rico, adding with a laugh: "I still have to memorize my lines."